I have really dry hands. Winter is just the worst for my hands; between the cold air (and the fact I never wear mittens) plus the added omg-someone-coughed-on-the-subway-MUST-WASH-HANDS during cold and flu season means my fingertips get all wrinkled and even cracked. Even when it’s not winter, my skin is sensitive enough that an encounter with harsh soaps will make me break out in little eczema patches… which is exactly where I found myself when a package from (seed) arrived. I had just gotten back from a trip upstate and the hotel soap left me with a patch of rough, flaky skin on my index finger. First, the therapeutic hand scrub. 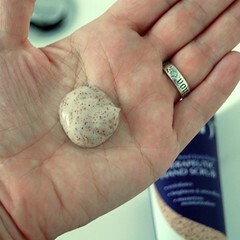 You can use this scrub on wet or dry hands, and having tried it both ways, I think you get better results on wet skin. It smells pretty good, citrusy and fresh. The consistency is a lot like the St. Ives apricot scrub, but maybe a little grainier. You get a glob in your hands, then just scrub it in all over… it feels a bit like Lava soap, if you’ve ever used that, but it definitely didn’t feel harsh. Rinsing it is kind of a pain. You have to really rinse rinse rinse to get it all off (and out of your sink). I’ve found some of the grains under my nails if I didn’t rinse well enough. After rinsing it off, the rough scaly patch on my finger wasn’t gone, but it was much less noticable and I think it went away faster than it would have without this scrub. I now use it about once a week, and my hands are always much smoother and definitely ready to be moisturized. 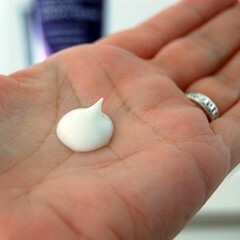 Which brings us to the healthy hand cream. I did already have one of their hand creams in the citrus scent, and I’m not that keen on that smell. It’s… well, it’s exactly like the smell of a green lollipop from the bank. You know the kind I mean. This, however, is part of their new line of lavender-scented stuff and it is heavenly. It’s really an exceptional lavender smell — on a par with the (considerably more spendy and less natural) L’Occitane lavender hand cream that I love. This (seed) cream not only smells fantastic, but it sinks in almost instantly without being greasy or sticky. My hands feel good and moisturized for a while afterward as well. So… is it good? So far, absolutely yes. 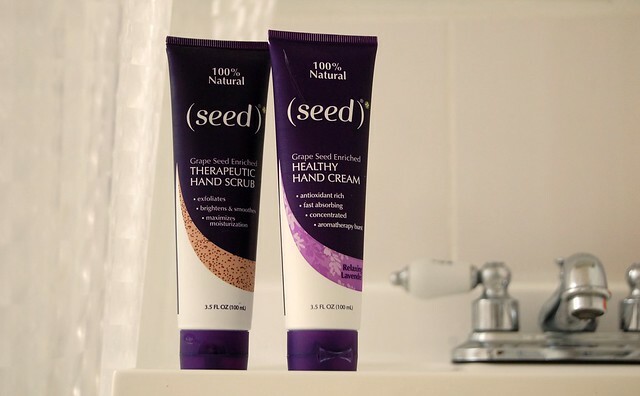 I’m holding off on giving this a full-fledged oh hell effing yes until the cold weather really sets in, BUT… winter or not, these are two great smelling, all natural hand treatments for less than $20. These — and all other (seed) products — are available at Alice.com if you can’t find them locally. Disclaimer: These products were sent to me by (seed), but the content of this post and its opinions are my own. For more information, check out my review policy.